The EOS 1100D / T3 is a great entry-level DSLR camera that's well-suited to its beginner target audience. The combination of proven metering, auto-focus and processing systems with a sensible 12 megapixel sensor and simplified control layout is a winning one. There are some notable downsides - the low-resolution LCD screen, lack of an integrated cleaning system, too smooth hand-grip, no spot metering mode, no manual video settings, and the puzzling omission of Scene Intelligent Auto mode - but the EOS 1100D / T3 ultimately delivers great image quality with the minimum of fuss at a very competitive price. The small body, large buttons and intuitive external controls, Creative Auto mode and on-screen Feature Guide make the EOS 1100d more appealing to owners of compacts looking to upgrade to a DSLR, but we'd also have liked to see an integrated cleaning system and the Scene Intelligent Auto mode included too, both features which would have made this camera even more beginner-friendly. On the other hand, the EOS 1100D / T3 offers a number of key features that have made their way down the EOS range, most notably the 63-zome metering, 9-point AF system and Digic 4 processor, which help to make this a reliable and responsive camera. The sensible 12 megapixel CMOS sensor may not make any headlines, but it does result in a very usable ISO range of 100-6400, with only the top setting really suffering from objectionable levels of noise. 720p video is another conservative choice, with no manual control over exposure and no auto-focusing during recording, but it does provide a solid enough introduction to the world of movie-making. We would have liked to have seen a higher-resolution LCD screen, though, with the 2.7 inch, 230K fixed screen looking rather under-specced compared to the competition and also the next model up the Canon range. It's pretty hard to complain, however, when less than £500 / $600 buys you a DSLR camera with a standard zoom lens, which is easy and quick to operate, has most of the features that you'll actually use everyday, and delivers excellent image quality even in low light. 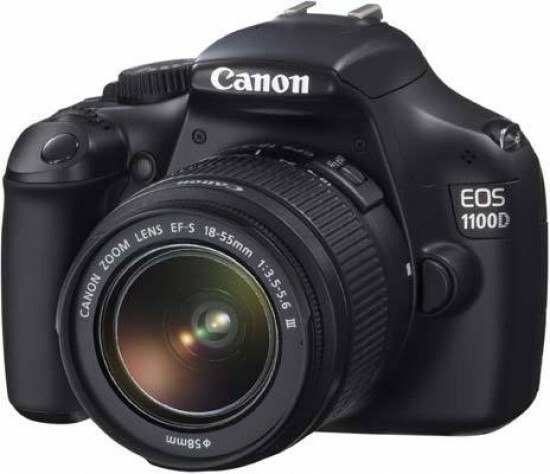 The Canon EOS 1100D / T3 is in many ways a bigger leap forward than the 600D model that was announced at the same time, bringing a compelling DSLR experience to a much wider audience. Highly Recommended!